The purpose of this study was to investigate the effect of a heat recovery by guiding the exhaust air through a heat exchanger in a hot air dryer. The temperature of inlet air could be increased by the developed heat recovery device to achieve energy saving. 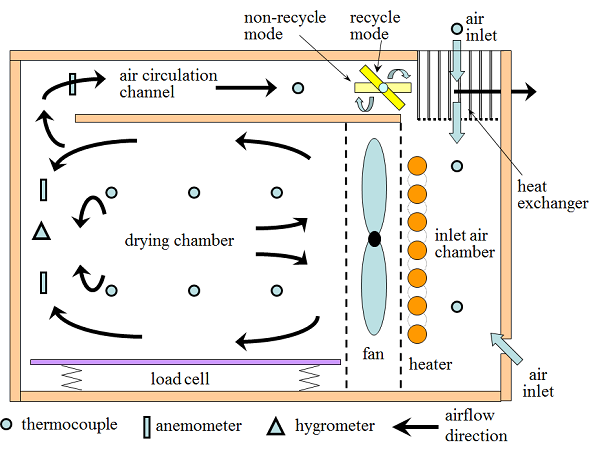 Experimental results indicated that the heat recovery device could increase the inlet fresh temperature 11℃, the effectiveness ratio of the heat exchanger was up to 70-80%, and heating efficiency of the heater was 50% through the analysis of inlet and outlet temperature, airflow rate as well as fuel consumption of the heater. In addition, the maximum temperature difference in the drying chamber was in the range of 0.6-1.2℃, indicating that the airflow in the drying was uniform, thus the uniform quality of agricultural produce could be obtained. In order to analyse the optimum operation conditions, the effect of fan speed on the temperature and airflow distribution was investigated in the drying system. The results showed that the optimum fan speed should be faster during start-up period and lower during a steady stage. P. P. Lewicki, “Design of hot air drying for better foods,” Trends in Food Science & Technology, vol. 17, no. 4, pp. 153-163, April 2006. P. K. Wankhadea, R. S. Sapkala, and V. S. Sapkal, “Drying characteristics of Okra slices on drying in hot air dryer,” Procedia Engineering, vol. 51, pp. 371-374, 2013. C. L. Hii, C. L. Law, M. Cloke, and S. Sharif, “Improving Malaysian cocoa quality through the use of dehumidified air under mild drying conditions,” Journal of the Science of Food and Agriculture, vol. 91, no. 2, pp. 239-246, January 2011. M. Djaenia and D. A. Sari, “Low temperature seaweed drying using dehumidified air,” Procedia Environmental Sciences, vol. 23, pp. 2-10, 2015. J. D. Hill, “Predicting the natural drying of hay,” Agricultural Meteorology, vol. 17, no. 3, pp. 195-204, September 1976. T. Filbakk, O. Hoib, and J. Nurmi, “Modelling natural drying efficiency in covered and uncovered piles of whole broadleaf trees for energy use,” Biomass and Bioenergy, vol. 35, no. 1, pp. 454-463, January 2011. B. Golman and W. Julklang, “Analysis of heat recovery from a spray dryer by recirculation of exhaust air,” Energy Conversion and Management, vol. 88, pp. 641-649, December 2014. B. Golman and W. Julklang, “Simulation of exhaust gas heat recovery from a spray dryer,” Applied Thermal Engineering, vol. 73, no. 1, pp. 899-913, December 2014. G. L. Borman and K. W. Ragland, Combustion engineering, New York: McGraw Hill, 1998. J. P. Holman, Heat transfer, New York: McGraw Hill, 2002.